Gordon Matthew Sumner was born in Wallsend (Northumberland), on October 2, 1951, by a working class family; His Father was a Milkman and His Mother was an hairdresser. He was the first of four sons and after him were born Philip, Angela and Anita. Gordon studied at the "St. Cubert Grammar Secondary School", a catholic institute, which doesnt represent a pleasant recollection for him: Teachers, in fact, tried to choke his spirit and his self-reliance. It was in this period that Gordon began to play, using the Uncles guitar, which was an emigrant in Canada. First landmarks for His playing were, obviously, bands like The Beatles and The Rolling Stones and then He began to listened some Jazz records, lent by a school fellow. After finished the Grammar School, Gordon entered at the Warwich University to study English, but He left it just after a term to went back in Newcastle, where he worked like an hodman in a building industry and, then, as employed in the public administration. Subsequently, he frequented a triennial course at the "Newcastle Teachers Training College", that give him the Secondary School Teaching qualification. It was just when he came back to Newcastle that began his bass player career (Or better, in that case, as double-bass player), playing with "The Phoenix Jazzmen". It was the trombonist of that band that gave him the nick-name "Sting", due to a yellow and black striped sweater, that made Gordon similar to a big bee. Then He played with "The Riverside Men", a traditional Jazz band, that bring him more popularity in the Newcastle musical ambients. In 1970 he entered, on permanent staff, in "The Newcastle Big Band", that was a good chance to play across the Europe. 1972 was an important year for Sting as musician. He founded his first band along with some member of "The Newcastle Big Band": "The Last Exit". The band made a little tour in France and Spain, and recorded a single: "Whispering Voices/Evensong". 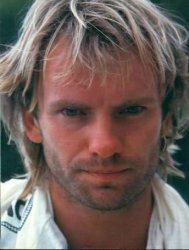 With the "Last Exit", Sting began to sing and writing songs, and this was very important for the next experience with The Police. Sting continued to play with the "Big Band" until 1976, year of its dissolution, and at the same time, He played live with the "Last Exit" by night, while, he teached, by day, at the "Roman Catholic First School", in Newcastle. But 1976 had a great importance for others reasons too. Sting met France Tomelty, who married him in May. In November, she gave birth to a child, Joseph. Moreover, Gordon decided to leave teaching to became a full-time musician. In consideration of the great local success, The Last Exit went to London: There They played in a lot of concerts, but nobody allowed them the gratuity of a Label contract. The Band decided then to came back home, where there wasnt any trouble in finding a well-rewarded concert. It was just in this period that Stewart Copeland, on tour in Newcastle with the "Curved Air", saw a live performance of the Last Exit, and so he decided to be introduced to Sting by the reporter/friend Phil Sutcliffe. Stewart asked Sting to move himself to London and, although the other members of the Last Exit were in disappointment, considering the previous failures, he replyed in the affirmative. It happened like this Sting put an end to his first band experience and founded "The Police" along with Stewart.